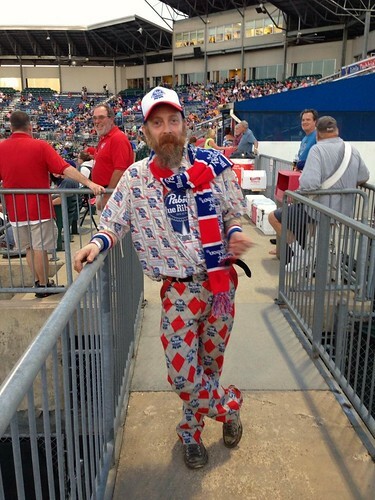 An appropriately hirsute Pabst Blue Ribbon man is beer-bedecked (also appropriately) during a baseball game at AT&T Park in Chattanooga, Tennessee, the home field of the Chattanooga Lookouts, on 28 April 2016. The Chattanooga Lookouts are a minor league baseball team, founded in 1932. In 2015, the team affiliated with the Minnesota Twins, a Major League team that, as the 1901–1960 edition of the Washington (D.C.) Senators, spent the longest period as the Lookouts' parent team. Pabst Brewing Company was founded in 1844 as the Best Brewing Company of Milwaukee, Wisconsin. Frederick Pabst, son-in-law of the brewery owner, would later join the brewery staff and eventually take control. After stewarding it into becoming the largest brewery in the country, [Pabst renamed the brewery eponymously] in 1889. [...] During the Chicago World's Fair in 1893, Pabst finished 0.3 points ahead of Anheuser-Busch] for its brews. The brewery responded by placing a blue ribbon on its packaging, something that remains to this day. Once the third largest brewing company in the United States, Pabst ceased all brewing operations in the mid-1990s. Since then, under several owners, Pabst has contracted with other breweries to produce its beers, as well as many 'legacy' American beers, such as Schlitz. In 2014, the company was purchased by a San Francisco–based private equity firm. Although sales of PBR (as Pabst Blue Ribbon is popularly known) are now declining, the beer, inexpensively-priced, experienced an ironic renaiassance among so-called 'hipsters,' during the the aughts and early teens, for a perceived anti-corporate ethic. 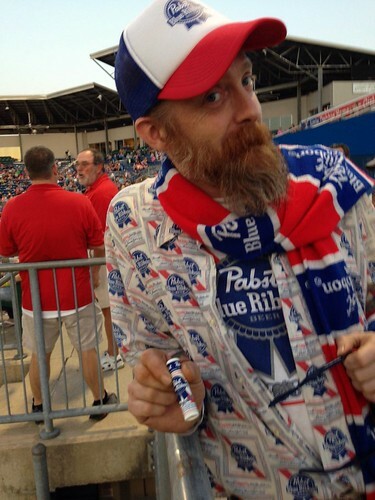 Is that 'beer' lip balm PBR Man is holding? He looks a bit thirsty without a beer in hand. Appreciating a master of malt: Wolfgang Kunze (1926-2016). Want to be a brewster? Know this man. On January 17, 2016, Wolfgang Kunze died, at 89. For decades, Mr. Kunze taught brewing, in Communist East Germany. His book, Technology Brewing and Malting, written in his native German — as well as translated into English, Spanish, Polish, Serbian, Hungarian, Chinese, and Russian— has long been a 'textbook' textbook for brewers throughout the world. Wolfgang Kunze, born on 7 August 1926 in Dresden, made an apprenticeship as “Brewer and Maltster" at the Waldschlößchen Brewery in Dresden (Saxony) from 1947 to 1949. Following he moved to Berlin where he began to study brewing technology at the VLB Berlin and Humboldt University. Against all the odds of the divided postwar Berlin, he graduated as a Diploma Brewing Engineer in 1952. The newly married young father decided - for family reasons - to move back to his home city Dresden which was located in the GDR. There he took a job as a teacher at the Vocational School for brewers and maltsters. What was originally conceived as an interim solution became his professional passion that occupied him for 38 years. So in the course of nearly four decades countless brewers and maltsters from across the GDR went through his classes. In 1959, he met a request to develop an official textbook for the training of brewers in the GDR. 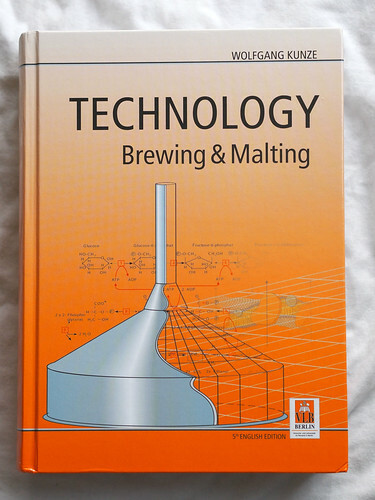 This project was realized in 1961 when the first edition of the book “Technology Brewing and Malting" was published. During the decades the textbook was published in the GDR in six editions, but also became very popular with the brewing trainees in West Germany. Wolfgang Kunzes credo “express complicated matters as simple as possible and in the language of the people” describes one of his key success factors both as a teacher and as an author. Continuing his career as Director of the Vocational School Dresden, Wolfgang Kunze additionally took over the lessons for brewing technology at the Engineering School for the food industry in Dippoldiswalde (Saxony). However, he refused an offer of the Technical University of Dresden for an unscheduled promotion due to a lack of time. In 1990, Wolfgang Kunze had been replaced by its successor Herwig Bittner, who has been the head of the Vocational School Centre for Agriculture and Food in Dresden until today. With his retirement in 1991, a new and very active period of his life began. He brought his extensive contacts and experience into the newly founded “VLB Office Dresden”. In this position, he was a respected unifying figure who has rendered great services in the convergence of East and West German brewing industry after the German reunification. In addition, the VLB took over the publishing rights of “Technology Brewing and Malting”, so that the future of this book was secured. In 1994, the 7th revised edition was published by the VLB, later followed by international editions in English, Polish, Chinese, Russian and Spanish as well as three additional German updates. Overall, his work with more than 60,000 printed copies in 7 languages has become one of the most successful textbooks for brewers worldwide. Wolfgang Kunze was also the initiator of the “Dresdner Brewers’ Day” in 1992. As a joint project of VLB with the Brewers Association of Saxony this meeting devoted mainly to the technical and technological development of the breweries in the new federal states. In its 22nd edition the Dresdner Brewers’ Day takes place on 8 April this year - the first time that Wolfgang Kunze will not be there. With great dedication, honesty and his Saxon humor, Wolfgang Kunze had accompanied the brewing industry up until old age. He was a regular and welcome guest at numerous trade events and on trade fairs at the stand of the VLB he was always available for an interview, a photo or even for an autograph. His merits for the brewing industry are documented in numerous awards: He was an honorary member of the VLB Berlin (2001), an honorary member of the German Association of Brewmasters and Maltmasters (DBMB, 2001), an honorary member of the Brewers Association of Saxony (2006), holder of the Bavarian Beer Medal (2008) and awarded with the Golden Badge of Honor of the VLB Berlin (2015). His withdrawal from public life began two years ago when a serious illness weakened him. Although he temporarily recovered somewhat again, he died on January 17, 2016. 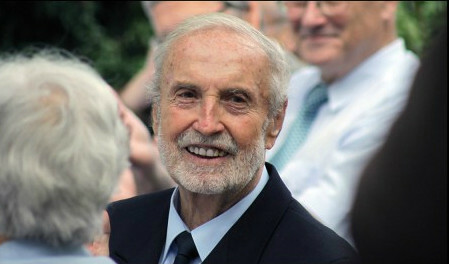 Wolfgang Kunze is survived by his wife Christa, with whom he was married since 1948, three children, eight grandchildren, seven great-grandchildren and a dog. Kunze's obituary was published by the Versuchs- und Lehranstalt für Brauerei (VLB), the organization he captained in Berlin, Germany. I defer to its translation. The VLB is a members association and was founded in Berlin in 1883 by German brewers and maltsters. For more than 125 years VLB has been working in the field of research, development and training for the brewing industry. Today, round about 120 people work at the VLB in the fields of research, teaching, information, consulting and service. As a "Registered Association" VLB is an independent institute, which co-operates with Berlin University of Technology in the field of brewing science and has a very close network into the brewing and related industry. Since 2002 VLB is the sole holder of Institut für Gärungsgewerbe und Biotechnologie zu Berlin (IfGB). As anthem: Just say no to ugly beer! 'Craft' beer seems to discover a new style or technique every year, if not month. Now it seems it to have discovered how to forget. I'm superficial. I'll immediately stipulate to that. I notice beauty before I look for substance. The beer above was a pleasant enough IPA, but remind me again: why must ‪'‎craft' beer‬ appear ugly to taste good? When I taste a beer, I use all of my senses. First, I see the beer. I look at it and admire it (or not). Muck? Uck! Then I sniff it, then I sip, and only then do I drink it down, luxuriating in the after-effect of the whole exercise. And, yes, I taste a beer using the sense of hearing. As the late, great Fred Eckhardt would counsel: "Listen to your beer!" The sound of a bottle cap popping off a bottle, the crack of CO2 as a beer can is pierced, the gurgle as a beer is poured into a glass: these are all cues and pleasures. When I was but a zymurgical pup, I was trained by a brewer to operate a DE filter. 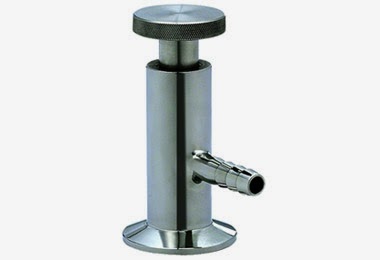 He taught me to pour a sample from the post-filtration valve and taste it for organoleptics —tasting for quality control. Beer, which only minutes before, unfiltered, had been brumous and dun, now was beautifully bright and briskly refreshing. He called this magical thing, "the happy valve." We would 'quality control' a number of times. Happy, indeed. In 1979, Fritz Maytag moved his dilapidated Anchor Brewing to beautiful new digs. 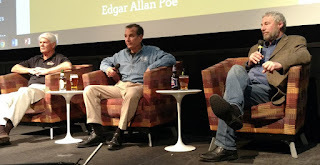 Afterward, he appealed to the intrinsic grace of beer: "Don't tell me that good beer can be made in an ugly brewery." Likewise, now, in 2016, don't tell me that my beer must be turbid to be flavorful, unseemly to be ineffable. Hell, no! There was a time, not too long ago, that good beer drinkers and 'craft' brewers would demean the macro-breweries for shortening the lagering times of their beers —the weeks, if not months, required for natural clarification and conditioning. Now, criss-cross, many 'craft'-ers consider a deliberate lack of patience to be a badge of honor, and clarity to be disparaged. 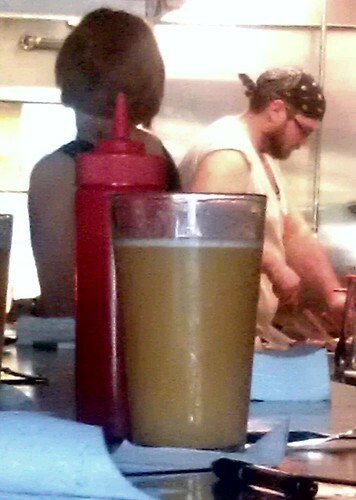 I gag at beers that appear, forgive me, as baby puke. A slight haziness or wispy cloudiness is one thing, but deliberate avoidance of beautiful brewing seems to be 'craft' beer's unfortunate newest thing. 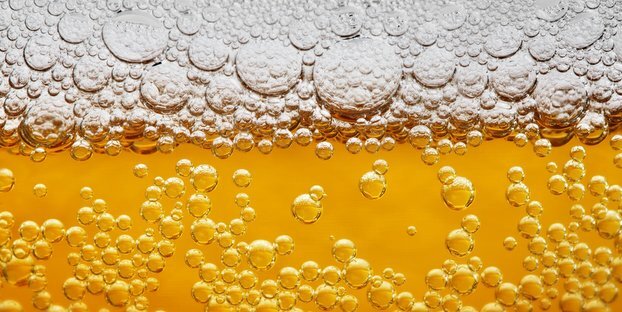 Chill haze occurs when a beer is chilled below approximately 1.6 ºC (about 35 ºF), and will usually develop into a permanent condition over time. The major components of these aggregates are certain classes of proteins and polyphenols that are derived from brewing raw materials, namely malt and hops.[...] 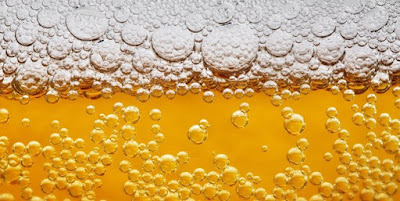 Colloidal haze is generally the result of protein molecules within the beer joining with polyphenols to form molecules large enough to cause turbidity. [...] Hazes caused by dry hopping are also colloidal hazes and are caused by polyphenols [tannins] from the hops combining with protein [from the malt], oxygen, or heavy metals. Proper and skillful brewing — with or without fining agents, with or without filtration— can and will produce exquisitely limpid beers. That's known as Stokes' Law —gravity's gift— and zymurgy —brewing science and know-how. I stand firmly in this position —saying yes to beauty— if accompanied by a shrinking minority of like-thinking brewers and drinkers, so-called London Murky and New England-style Murky IPAs notwithstanding. ...when you could drink this? "Just say no to ugly beer!" Pic(k) of the Week: one in a weekly series of personal photos, usually posted on Saturdays, and often, but not always, with a good fermentable as the subject. Camera: Olympus Pen E-PL1. When it comes to analyzing the possibility of an upcoming brewery bubble burst, or not, there's been a need for a convenient metric to compare brewery count per capita with national beer production per capita, over different years (comparing apples and oranges). But there hasn't been one. So, I may not be a statistician, but I've created, what I call, the Brewery Capacity Quotient (BCQ). I calculate it for any given year by taking the total number of breweries during that year, multiplying that by the number of barrels produced nationally that year per 100,000 population, dividing that factor by 1,028.619, and multiplying that quotient by 100. I've used the number 1,028.619 as the constant in the denominator because it's the product of the number of U.S. breweries operating in 1873 multiplied by the barrel production that year per 100,00 population. I chose 1873 as the baseline because, until 2015, that was the year that comprised the most breweries in the nation. As the U.S. had a much smaller population then than now, I believe the data indicate an evident brewing capacity. There were 4,131 breweries in the U.S. for a nationwide population of 38,555,983. That would be the historically high count of breweries (until 2015). Per 100,000 citizens, there were 10.74 breweries that year. In total, those breweries produced 9,633,323 barrels of beer: 0.249 barrels (7.74 gallons) of beer per person. There were 44 breweries (a post-Revolutionary War nadir) for a population of 226,545,805, working out to .194 breweries per 100,000 population. In total, these few breweries produced 188,373,657 barrels of beer: 0.8315 barrels (25.78 gallons) of beer per person. There were 4,144 breweries in a population of 320,090,857, the most breweries ever in the nation. That amounted to 1.29 breweries for every 100,000 citizens. In total, these breweries produced 174,721,000 barrels of beer (13.65 million fewer barrels than in 1980). Per capita, that was 0.545 barrels (16.92 gallons) of beer per person. For what it's worth, the BCQ was tiny in 1980, but in 2015 it was more than twice that in 1873. Brewery bubble? I still don't know. It could be that it's per capita production that's the best indicator. In that case, 2015 is nearly double that of 1873, but 40% of 1980. Statisticians: take me to task. Twain's Brewpub & Billiards, in Decatur, Georgia, on 7 April 2016. Toward a people's definition of 'craft' beer. The BA's [U.S. Brewers Association] definition of craft is, to a large degree, self-serving to the interests of its members. To the consumer, 'craft' likely means 'not light beer' that costs more than Bud Light. To market analysts, that's also exactly what 'craft' means. They haven't kicked Ballast Point out of the craft category, since the Ballast Point beers still taste the same, still cost the same, still have the same market position. They don't care who owns them." In the same post, however, Bryson notes that a pay-for-view industry analyst has reported not-so-sanguine news on first quarter on-the-premises * beer sales. On-premise beer sales were slow - declining -3.1% year-over-year - lagging the overall alcohol category (-0.6%). The overall import-beer category is down 3%, but Corona brands are up 3.5% and Stella Artois up 3.7%. 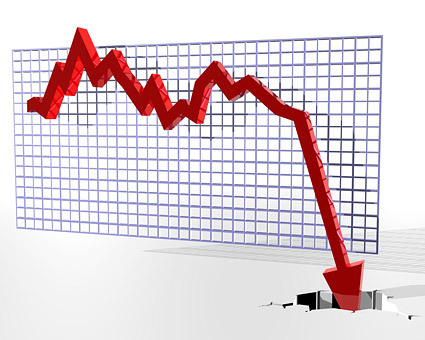 Craft sales have dipped into negative territory (-0.8%) as several major brands declined. Sales declined for both Blue Moon (-3.0%) and Sam Adams (-13%) brands, while Goose Island (18%) and Ballast Point (42%) showed major gains. Maybe things develop in a different direction.[...] Craft beer could well split into local and macro with only big craft fading, too big and familiar to be considered authentic. [...] Will that matter much to you? Likely not other that it will be you buying the macro craft, wine or hard liquor. You'll be happy. Cassandra or chicken little? Results from one quarter, although worrisome, are not a trend...yet. But a people's 'craft' beer? I'll drink to that — even if this consumer might choose a local craft beer first, all things (and that's many) being equal. and costs more than one. Consumers don't care where it's from. Lesson for today: The Great Chicago Lager Riot of 21 April 1855. It was one hundred sixty-one years ago, today: the Great Chicago Lager Riot of 21 April 1855. Chicago's first civil disturbance, on April 21, 1855, resulted in one death, sixty arrests, and the beginning of political partisanship in city elections. On March 6, a 'Law and Order' coalition swept city elections. The coalition was formed by anti-immigrant, anti-Catholic nativists —the Know-Nothings— and temperance advocates who were interested in moral reform and public order. With most municipal services either privatized or organized at the neighborhood level, city elections in the 1840s and early 1850s had been nonpartisan contests of little interest to anyone except real-estate owners. The extremely low voter turnout permitted this quietly mobilized coalition to win control of city hall with a thin base of popular support. Once elected, Mayor Levi Boone and the new council majority hiked liquor license fees [from $50 to $300] while also shortening license terms from one year to three months. Expecting resistance, Mayor Boone 'reformed' the city's police force: tripling its size, refusing to hire immigrants, requiring police to wear uniforms for the first time, and directing them to enforce an old, previously ignored ordinance requiring the Sunday closing of taverns and saloons. These were intentionally provocative acts aimed at Germans and Irish accustomed to spending their leisure hours in drinking establishments. Germans organized to resist the $300 license ordinance, raising defense funds for tavern owners arrested for noncompliance. Prosecutions clogged the city courts and attorneys scheduled a test case for April 21. This, in effect, scheduled the riot. A huge crowd assembled to support the defendants. Mayor Boone ordered police to clear the courthouse area, which resulted in nine arrests. An armed group from the North Side German community decided to rescue the prisoners, but Boone held them off by keeping the Clark Street drawbridge raised until he was able to assemble more than two hundred policemen. When the bridge was lowered and North Siders surged across, shooting began. Boone called in the militia, and the riot ended in minutes. The riot mobilized Chicago's immigrant voters. In March 1856, a heavy German and Irish turnout defeated the nativists, causing the $50 liquor license to be restored. More important was the renewed attention to city elections on the part of political party leaders, ending the era of municipal nonpartisanship. Never again would city elections be of such limited interest that a small group of extremists could win surreptitiously. The Native American Party, renamed in 1855 as the American Party, and commonly known as the Know Nothing movement, was an American political party that operated on a national basis during the mid-1850s. The movement arose in response to an influx of migrants, and promised to "purify" American politics by limiting or ending the influence of Irish Catholics and other immigrants, thus reflecting nativist and anti-Catholic sentiment. It was empowered by popular fears that the country was being overwhelmed by German and Irish Catholic immigrants, whom they saw as hostile to republican values, and as being controlled by the Pope in Rome. History lesson learned: Don't raise beer taxes. Or would there be more? Returning to 2016 for a beer, in this case, a lager, as befits the occasion: a pilsner, American-brewed, although I would have preferred it served in a glass better suited to its spicy, floral aromatics. No rioting ensued. 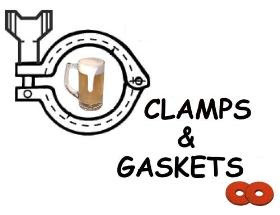 Clamps & Gaskets: News Roundup for Weeks 13/14, 2016. The Independent Book Publishers Association has awarded a 2016 silver medal for “Best New Voice: Non-Fiction” to Drinking in the Culture: Tuppers Guide to Drinking in Europe, a beer-travel book written by Washington, D.C.-area good-beer advocates, Bob and Ellie Tupper. 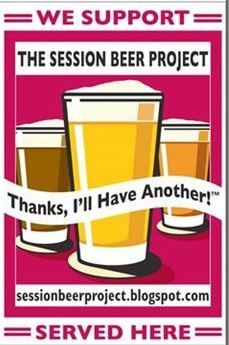 So what exactly is a “session beer?” Defining them is actually trickier than is sounds. They’re not exactly a beer style or even a collection of styles, more like an idea. 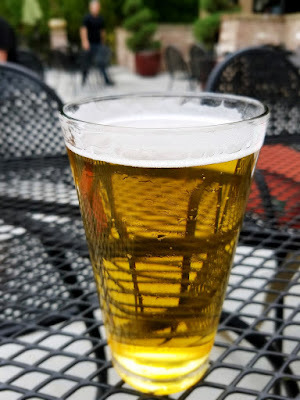 The basic notion is that a “session beer” is one that you can drink during an entire “session” of drinking and still be relatively lucid and hold up your end of the conversation. —Via Jay Brooks on Session Beer Day, at Mercury News. The crony capitalists of ... (gasp) 'craft' beer. Why does growth via a private sale raise the ire of beer drinkers while growth via government subsidies gets barely any backlash? and $5 million to California-based Sierra Nevada Brewing to build new facilities in Asheville. The government of Virginia gives $3 million to Bend, Oregon-based Deschutes Brewing to open a facility in Roanoke. (and from the city government of Richmond) $31 million in bonds to build its brewery and bistro. The city of Berlin, GERMANY, gives Stone Brewing 2.3 million euros to open a facility in the city — if certain employment and investment goals are met. Based on today's exchange rate, that's $2 million, 615 thousand U.S. dollars. Merle Haggard, revered country singer of common man anthems, dies at 79. Super Bowl winning quarterback, Seattle Seahawks' Russell Wilson and 6th century patron saint of brewers, St. Arnold: DNA discovers that they're family. Craft beer is, tautologically, beer made by craft breweries. But 2015 was the year that brewing broke "craft beer." The once-elegant dichotomy between craft and noncraft, fraying at the edges since the formation of Craft Brewers Alliance, was shattered with brewery acquisitions, mergers, sales of minority stakes, and mission creep into non-beer products. —Via Jeff Alworth, at Beervana. 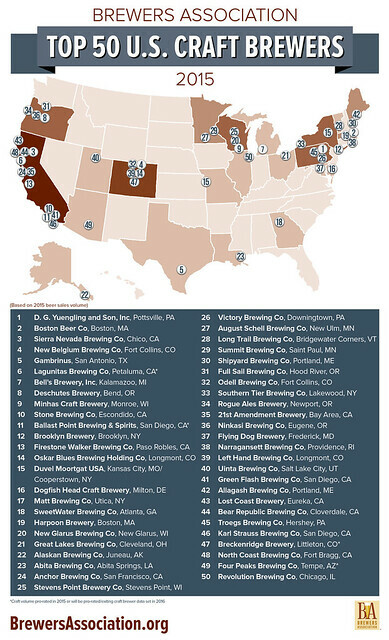 The [U.S.] Brewers Association has released its annual lists of the top 50 U.S. brewing companies and the top 50 U.S. 'craft' breweries, based on sales volume. Villanova University wins March Madness, defeating North Carolina in the 2016 National Collegiate Athletic Assocaition (NCAA) annual basketball championship with a 3-point shot as time expired, possibly the most exciting finish in the tournament's history. The "Panama Papers": Vladimir Putin, the 1980s Brinks Heist, various world leaders, off-shore banks, crooks, money-launderers. Governments across the world are investigating possible financial wrongdoing by the rich and powerful after a leak of four decades of documents from a Panamanian law firm, Mossack Fonseca, that specialized in setting up offshore companies. The documents, covering a period from 1977 until December 2015, were leaked to more than 100 news organizations around the world in cooperation with the U.S.-based International Consortium of Investigative Journalists (ICIJ). Medal of Freedom recipient Dr. Joe Medicine Crow —historian, activist, author, the last link to the Battle of Little Big Horn, and the last Crow war chief— dies at 102. The U.S. Department of Justice announces that BP will pay $20 billion in civil and federal penalties and fines resulting from its role in the Deepwater Horizon oil rig explosion that killed 11 people and devastated much of the Gulf of Mexico ecosystem in 2010. However, "75% of this fine is tax deductible for BP, meaning that US taxpayers will foot most of the bill for the largest oil spill in history." 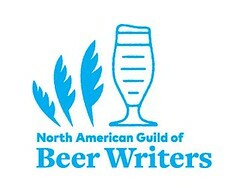 Some [beer] bloggers have suggested they are not bound by any ethical rules because they are just bloggers, not writers. I think the audience should be able to tell whether the writer whose work they are reading is tethered by ethical rules or is just flailing wildly at every free beer or book tossed his or her way. —As quoted by Alan McLeod, at A Good Beer Blog. Writer James Fallows at The Atlantic agrees with beer writer Jeff Alworth: 'craft' breweries are good for cities. Breweries are industrial operations, and they’re expensive. Beer is a mass beverage, and even making it on a brewpub scale means you have to have quite a bit of space for the brewhouse, fermentation, and storage. All that equipment costs a lot, and real estate does, too. When you’re spending a quarter- or half-million dollars on equipment, you can’t afford expensive commercial space. So breweries end up on the fringes, in bad parts of town where the rent is cheap. That alone is the first step of revitalization. But breweries aren’t like the average industrial plant. They are people magnets, bringing folks in who are curious to try a pint of locally made IPA. In fairly short order, breweries can create little pockets of prosperity in cities that can (and often do) radiate out into the neighborhood. Pretty soon, other businesses see the bustle and consider moving in, too. It doesn’t hurt that breweries often find run-down parts of towns that have great buildings. Once a brewery moves in and refurbishes an old building, it reveals the innate promise of adjacent buildings to prospective renters. Private equity in the 'craft' beer market could cause a second wave of upheavals within a decade. Despite what you might have believed, [private equity] investors aren’t satisfied to collect off annual profits. A traditional private-equity fund, which pools money from wealthy individual and institutional investors to take equity stakes in companies, has a finite lifespan of usually 10 years. When that fund sunsets, investors expect to get paid out. A lot. What does this mean for the industry? Of the more than half-dozen high-profile equity deals that have taken place recently, most of the PE firms will look to exit three to five years afterward, launching a rash of the resales and public offerings that the craft community so derides. If a profitable exit doesn’t look possible, the firm may hold longer, but something has to happen by the end of the fund’s 10-year lifespan, or in some cases a few years afterward if it gets an extension from investors. —Via Tara Nurin, at Forbes. A 'shot' with that latte? Starbucks to begin selling beer and wine at several of its Northern Virginia coffeehouses. In Cologne, Germany — Kölsch's origin city and protected geographical indication (PGI) — Kölsch beers are served in Stange: cylindrical glasses holding 0.2 liters (~6.76 U.S. fluid ounces). The glass above was 12-ounces, hence, freely, a double-Stangen of draught Reissdorf Kölsch, indeed brewed in Cologne. Top-fermented [ales], Kölsch beers are characterized by a lightly fruity yeast note in aroma and taste, as well as a pleasant hoppy bitterness. [...] Fermentation takes place at a temperature between 15°C and 20°C (59°F and 68°F). The orginal gravity is between 11°P and 12°P, while the alcohol by volume (abv) is 4.8%. 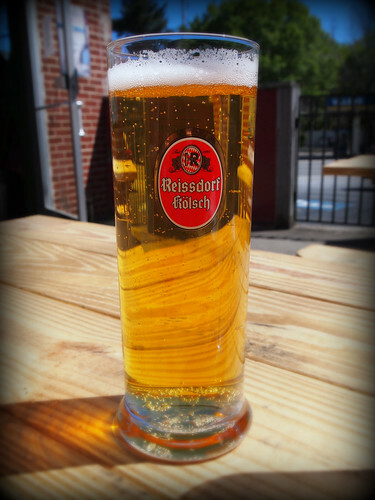 I enjoyed this draught pour on a Sunday afternoon, 3 April 2016, not in Germany, but at a pub in Decatur, Georgia, USA, outdoors on its patio. 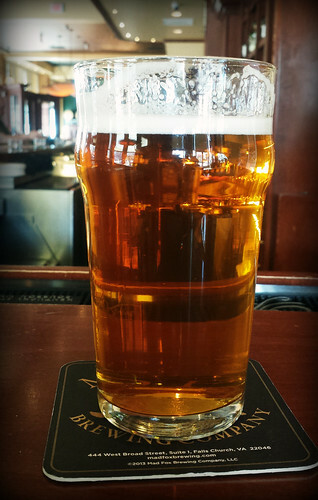 If it had suffered any deleterious effects from a trans-Atlantic voyage, this draught Reissdorf Kölsch hid them well. It was refreshing and tasty —not with any American-imposed fruit, pumpkins, bourbon, brettanomyces, overdosed hops, or whatever— but with a Continental just-right dollop of yeast-and-hop-derived lemony fruit. If one would demean such a Kölsch delight as "easy-drinking," to slow down and savor should be the prescription. I didn't engage in the former but, under the vernal sun, I did blithely acquiesce to the latter. There are 4,824 breweries in the United States (and maybe even 6,080)! The total number of breweries operating in the U.S. at the end of 2015? Four thousand eight hundred and twenty-four (4,824) breweries, says the TTB (the Alcohol and Tobacco Tax and Trade Bureau of the U.S. Department of the Treasury). Together, these breweries brewed 175,243,006 barrels of beer. The National Beer Wholesalers Association (NBWA) has just published this data, with analysis from its chief economist, Lester Jones, in conjuction with its national legislative conference being held this week in Washington, D.C.
▶ produced 2,767,216 barrels (1.1% of all beer brewed in the U.S. in 2015). 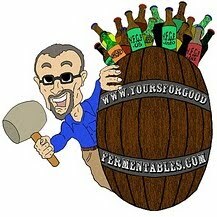 Jones notes the anomaly of 566 breweries producing a barrel or less (!) but accounting for over 94,000 barrels per year. These 'brewing' companies contract with other breweries to produce their beers, a practice which other larger breweries may do as well. The Brewers Association had a different count. 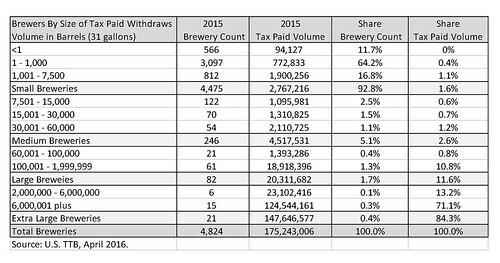 The [U.S.] Brewers Association reported a lower count for 2015, than the NBWA: a total of 4,269 breweries. Nevertheless, either number is a historical high. In 1873, the BA reports, there were 4,131 breweries, the most in the U.S. until now. The TTB and the NBWA base their numbers on those breweries with brewers licenses who have paid excise tax during the year. The BA has different criteria and different categories. A microbrewery, for example, it considers to brew fewer than 15,000 barrels per year; a brewpub to be a restaurant-brewery that sells 25 percent or more of its beer on-site; a regional brewery to brew between 15,000 and 6,000,000 barrels per year; and, a large brewery, to brew in excess of that. As to what the BA considers 'craft' of non-'craft': that's a tripartite definition combining arbitrary production limits and subjective concerns. Annual production of 6 million barrels of beer or less (approximately 3 percent of U.S. annual sales). Beer production is attributed to the rules of alternating proprietorships. Less than 25 percent of the craft brewery is owned or controlled (or equivalent economic interest) by an alcoholic beverage industry member that is not itself a craft brewer. A brewer that has a majority of its total beverage alcohol volume in beers whose flavor derives from traditional or innovative brewing ingredients and their fermentation. 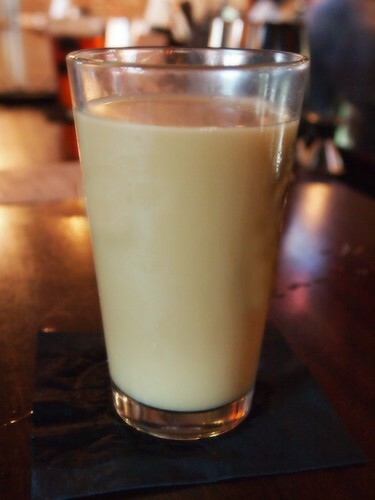 Flavored malt beverages (FMBs) are not considered beers. 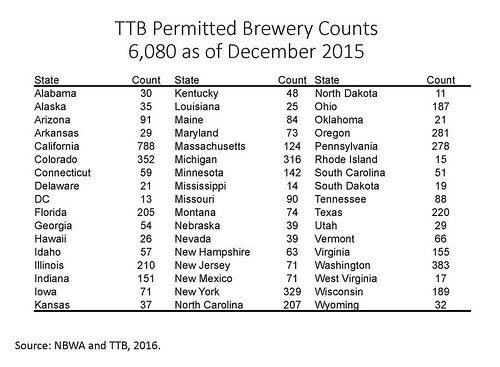 The TTB also reports on the number of breweries that have Brewer's Licenses, whether those breweries are brewing now or will soon. The state with the least is North Dakota at 12. The city of Washington, D.C. —neither a state nor a city within a state— is just above it, with 13. Jones of the NBWA notes that breweries were opening at the rate of almost four per day in 2015. But here's the kicker. In addition to those four thousand eight hundred and twenty-four (4,824) breweries that were operating in 2015, there were one thousand eight hundred and eleven (1,811) more not yet brewing but with their licenses in hand. That's six thousand and eighty (6, 080) "permitted" breweries already on the playing field in the U.S. for 2016. Read the entire report form the NBWA: here. Read the NBWA's mid-year 2015 report on 'craft' beer: here. The BA has published its lists of the top 50 overall brewing companies, by sales volumes, in 2015, and the top 50 'craft' breweries of 2015, by sales volume (according to its 'craft' definition). See those: here. Looking back four years, according to the BA there were 3,722 breweries in the U.S. in 2014; 2,917 in 2013; 2,456 in 2012. Since this blog was long reported from the mid-Atlantic area, I'll mention the ranking the 'permitted' brewery rank of the three area jurisdictions. Again, the city of Washington, D.C. was at #50 with 13 breweries; the commonwealth (state) of Virginia at #14 with 155; the state of Maryland, #23 with 73 breweries. A barrel of beer, when a brewery's production is reported, is not a physical container. Rather, it's a unit of volume measurement equal to thirty-one U.S. gallons. Read more: here. 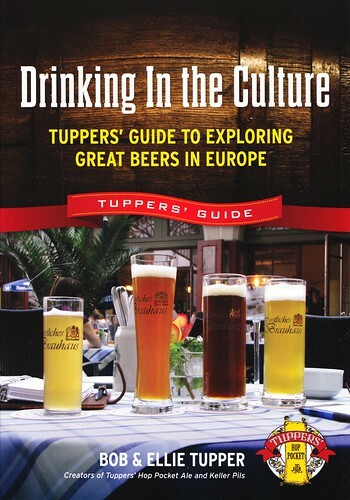 "Drinking in the Culture: Tuppers Guide to Drinking in Europe" wins IBPA silver medal. The Independent Book Publishers Association has awarded a 2016 silver medal for “Best New Voice: Non-Fiction” to Drinking in the Culture: Tuppers Guide to Drinking in Europe, a beer-travel book written by Washington, D.C.-area good beer advocates, Bob and Ellie Tupper. Drinking In the Culture is the first ever guide to finding, not just good beer, but good beer places, in two dozen of the best cities in the world to drink local beer. From the universities of Sheffield, England, to the historic palaces of Prague, from the well-known beer mecca of Brussels to the little Bavarian gem of Passau, here are gardens, cellars, plazas and ancient halls, all featuring unique and superb local brews amid the rich history and culture of Europe. A quick orientation to the city as you arrive. The history and culture of the city and how they have affected the local beer culture. A “sixpack” or more of the best places—brewpubs, gardens, festivals, and breweries—to experience the beer culture of that city and region. Suggestions for hotels and out-of-the-ordinary sights. Day trips and excursions for more good beer. Plus local advice, travel strategies, and tips on getting there, getting around, and staying safe. In Drinking In the Culture, the Tuppers share what they have learned about European beer travel. For everyone from boots-on-the-ground beer geeks to armchair travelers, this book offers an anecdotal and affectionate view of the hundreds of rich and distinctive beer-drinking experiences Europe has to offer. The Tuppers are longtime observers of the good beer scene: locally in their home base of the Washington, D.C.-area, nationally, and internationally. Bob Tupper has taught high school history and government for 45 years; Ellie Tupper is a writer and editor for an international scientific society. The husband-and-wife duo has been hosting beer dinners and tastings since before such things were common or 'craft' beer was called 'craft.' And they continue to do so today. They started taking notes on beers in 1979; , their tasting database has grown to over 30,000 entries. The Independent Book Publishers Association (IBPA) is pleased to announce the 2016 Benjamin Franklin Book Award finalists recognizing excellence in independent publishing. Over 150 finalists are featured in 54 categories. Gold winners will be revealed Friday, April 8, 2016 at a special ceremony during IBPA’s annual Publishing University conference in Salt Lake City, Utah. All are welcome. 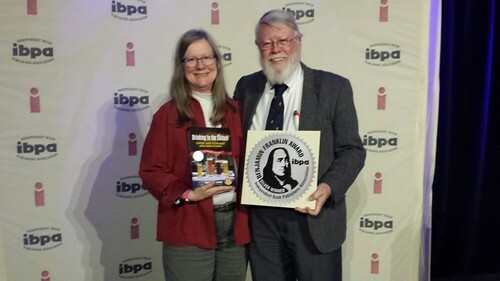 Winning an IBPA Benjamin Franklin Award remains one of the highest national honors for small and independent publishers. To be a 2016 finalist, a book must have been published in the United States between January 1, 2015 and December 31, 2015. The Benjamin Franklin Awards ceremony, open to all, is the culminating event of the awards cycle each year. Held Friday, April 8, 2016 during IBPA’s annual Publishing University in Salt Lake City, Utah, the 2016 ceremony will include the announcement of one Gold winner in each of the 54 categories. Who are Bob & Ellie Tupper? Read this profile from Tammy Tuck at the Washington City Paper. 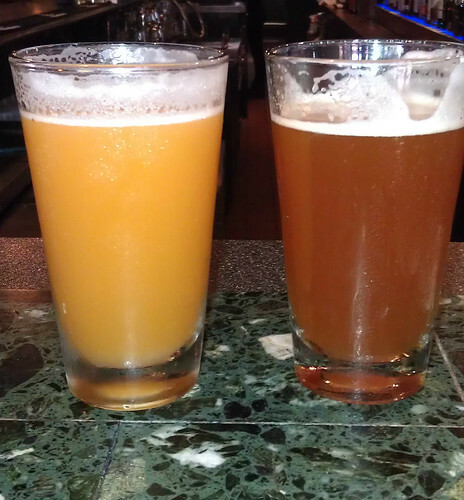 Follow their blog of beer-travels and beer-tastings at CultureAlePress. Founded in 1983 to support independent publishers nationwide, the Independent Book Publishers Association leads and serves the independent publishing community through advocacy, education, and tools for success. With over 3,100 members, IBPA is the largest publishing association in the U.S. Its vision is a world where every independent publisher has the tools and knowledge needed to professionally engage in all aspects of the publishing industry. 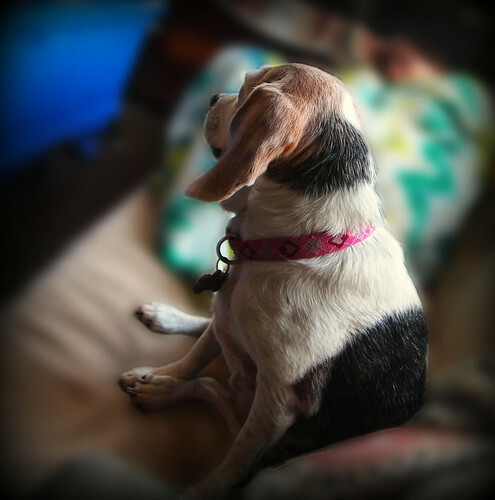 Pic(k) of the Week: Pondering beagle. Drink a beer and save a rabbit. Maureen O'Prey is the author of Brewing in Baltimore, a history of that Maryland city's brewing heritage. 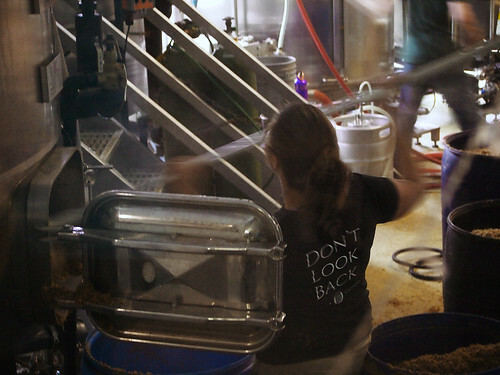 She's now hard at work writing a history of brewing in the entire state of Maryland. She, of course, likes beer. She also likes bunnies. Who doesn't like bunnies? Ms. O'Prey asked me to spread the word on a fundraiser for Friends of Rabbits, a non-profit 501c3 rabbit rescue, education, and re-homing organization, based in the Washington D.C./Baltimore, Maryland, greater metropolitan area. The event is this Saturday, 9 April 2016, in Manassas, Virginia, at BadWolf ... a brewery. Beer and bunnies. Who wouldn't like that? BadWolf Brewing in Manassas, Virginia, is hosting a fundraiser for Friends of Rabbits, from 5-10 pm, on Saturday, 9 April 2016. 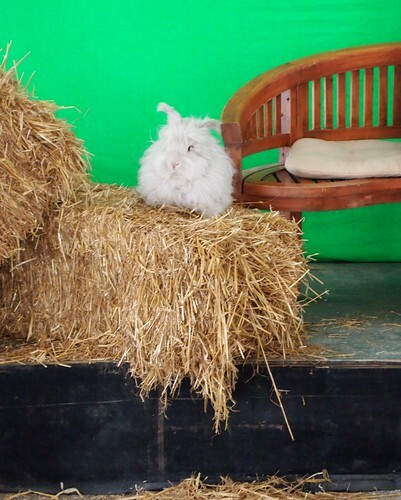 And, of course, there will be rescued rabbits in attendance for people to meet and greet and learn about. The Frenchman food truck is providing food, including vegan fare. For more information, go to BadWolf's Facebook page: here. Don't eat bunnies. Drink beer ... and help save the quadrupeds! BadWolf Brewing —Manassas, Virginia's first ever 'craft' brewery— opened its first location, a small-scale 'nanobrewery,' in late June 2013. YFGF visited in early 2014. Since then BadWolf has opened a second location, a production facility focused on producing for distribution, with a larger brewery and much more seating. And that's where the fundraiser will be. 7 April: today and in history. Beer writer Lew Bryson's campaign to bring back 'session' beer, because a beer doesn't have to be big to be bold. On the web: The Session Beer Project. And, no! Prohibition did not end on this day in 1933. Musical genius, the beautiful, incomparable Billie Holiday (April 7, 1915 - July 17, 1959) would have been 101 today. Billie Holiday (”Lady Day”) is considered by many to be the greatest of all jazz singers. In a tragically abbreviated singing career that lasted less than three decades, her evocative phrasing and poignant delivery profoundly influenced vocalists who followed her. Although her warm, feathery voice inhabited a limited range, she used it like an accomplished jazz instrumentalist, stretching and condensing phrases in an ever-shifting dialogue with accompanying musicians. Famous for delivering lyrics a bit behind the beat, she alternately endowed them with sadness, sensuality, languor, and irony. Clamps & Gaskets: News Roundup for Weeks 11/12, 2016. Death toll in Pakistan Easter suicide attack climbs past 70. Taliban Muslim terrorists targeted Christian families at picnic. It's one of those beers that is the remarkable result of skill and luck, and one of the joys of life that is ours for the tasting. And it's not really that much of a stretch to suppose that joy, whatever measure, can serve as a refutation of evil beyond belief loose in the world. Considering the provenance of Orval, we'll take it that the fruits of simple labor, produced in an atmosphere of prayer and tranquility, will prevail in the end. 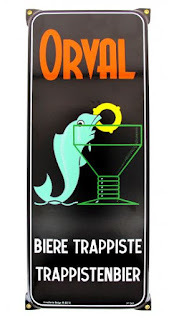 —Via Tom Bedell at Tap Beer of the Week, writing on Orval Day, a commercial celebration of Orval, a beer brewed in Belgium by Trappist monks. Saving Heurich's Lager. How a homebrewer, a Washington, D.C. brewery, and a museum are resurrecting a long-lost beer. Twitter — online 'social-networking' that enables users to send and read short 140-character messages called "tweets"— is ten years old; 'craft' beer has been using the service for eight years. —Via Tom Acitelli, at All About Beer. Oregon's Deschutes Brewing, the 8th largest U.S. 'craft' brewery, to open a 2nd production facility, in 2019, in Roanoke, Virginia. A new peer-reviewed study by renowned climatologist James Hansen warns that the effects of global warming may be sooner and more catastrophic than generally envisioned. Major melting of Greenland and Antarctica can not only happen quite fast — leading to as much as several meters of sea level rise in the space of a century, depending on how quickly melt rates double — but that this melting will have dramatic climate change consequences, beyond merely raising sea levels. More than 30 people murdered, more than 200 wounded after ISIS terrorists set off bombs in Brussels, Belgium. A soupçon of good news amid disgusting horror: brewers from award-winning Allagash Brewing of Maine, who were visiting Belgium, were safe although in Brussels during the bomb blasts. The [U.S.] Brewers Association has released its preliminary data on 'craf' beer's performance in 2015. As an industry, it has reached 12% of the overall beer industry, by volume of beer sold. In 2015, craft brewers produced 24.5 million barrels, and saw a 13 percent rise in volume3 and a 16 percent increase in retail dollar value. Retail dollar value was estimated at $22.3 billion, representing 21 percent market share. 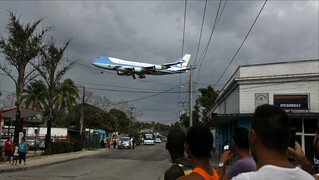 in Havana, Cuba, President Obama will participate in a meeting between U.S. business leaders — part of the massive presence of Americans here this week — and Cuban entrepreneurs who are part of the private sector the administration hopes to aid with a loosening of the continuing U.S. trade embargo. The meeting will be held at a cavernous beer brewery along the waterfront of Havana Bay. 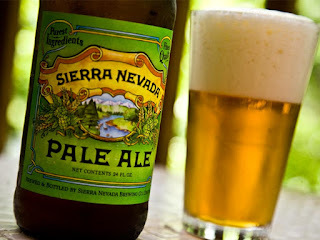 A 35-year old 'craft' beer milestone: Sierra Nevada Pale Ale —putatively the paradigm for the American Pale Ale style— was first first brewed in March 1981. The Federal Drug Administration (FDA) pushes forward the date that chain restaurants must post calorie information for beer, etc., from December 2016 into 2017. What this bill means for small brewers is that a beer from a local brewer that was available in one or a few of a chain’s stores would be exempt from the requirement. 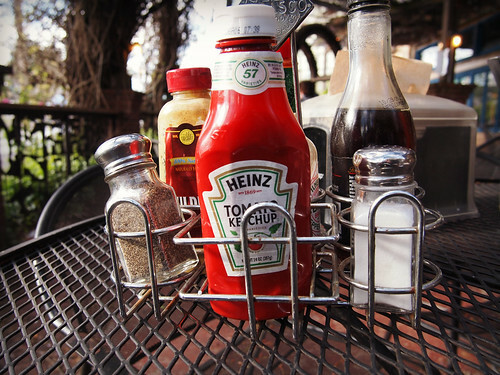 Of course, the restaurant group would have the option of labeling the calories on menus and menu boards if they choose to and could ask brewers for that info. The USDA Nutrient Database can be the reference that brewers can point to in that circumstance, which should allow brewers to not have to test every single beer at high cost. —Via Craft Beer & Brewing. 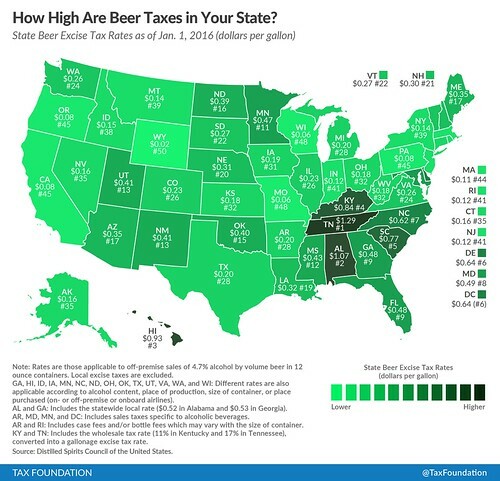 How high are beer taxes in your state? Half Moon Bay Brewing Company, of San Francisco, California, brews a beer with the wastewater from showers, sinks, and clothes-washing. The German beer 'purity' law, the Reinheitsgebot is five-hundred years old, this year. On April 23, 1516, the Duke of Bavaria, Wilhelm IV, issued what would only much later come to be called the Reinheitsgebot, or the “purity law.” Originally, though, that element was downplayed—it’s just the third stipulation: “in all our towns, marketplaces and the whole of the countryside, that beer shall have no other ingredients than barley, hops, and water be used and employed.” When you read the full document, running about 320 words in translation, these 27 don’t appear to be the main point. The first two stipulations regulated prices, capping what a publican could charge, particularly during different seasons. There was also a fourth provision, again about pricing, and a comment at the end where Duke Wilhelm reserved the right to change anything in the law during grain shortages. —Via Jeff Alworth, at All About Beer. Cigar City, a leading independent brewery based in Tampa, Fla., has agreed to sell controlling interest to Boston-based private equity firm Fireman Capital Partners, which already owns majority stakes in Oskar Blues, Perrin Brewing and the Utah Brewers Cooperative outfit that includes the Wasatch and Squatters brands. Together, the five craft breweries make up what the firm calls United Craft Brews LLC., a separate holding company and special purpose fund set up specifically for craft brewery acquisitions. Total U.S. beer sales showed no growth in 2015, holding at around 2.9 billion case equivalents, but 'craft' beer up 15%, and its market share up from 10% to 11.5%. Imports up 6.2%; market share increases from 14.2% to 15.1%. 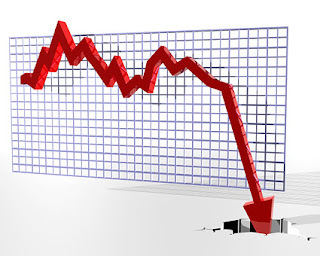 'Macro' down 3.1%, from 75.8% to 73.4% share of the market. —Via National Beer Wholesalers Association. —Via beer writer Craig Gravina, at Drink, Drank. 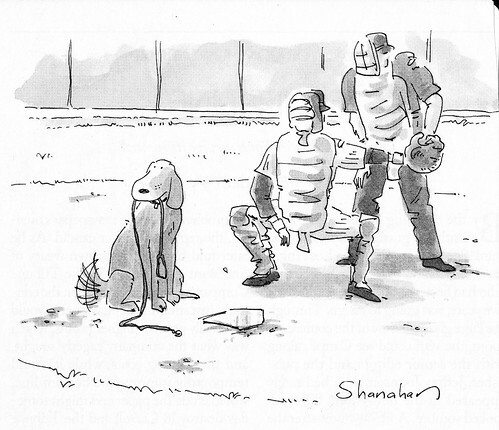 Baseball returns today, and all is right with the world. And, if not, there's always tomorrow. Mashing is the term given to the start of the brewing process, where crushed grains are mixed with water to form a porridge-like mixture called the "mash." It is in the mash that the [barley] malt and other cereal starches are transformed into sugars and proteins and other materials made soluble, creating the sweet fermentable liquid called wort. Spent grain is the compact waste of malt and/or grains left after mashing and lautering in the brewhouse. [...] Spent grain consists primarily of barley husks, protein, and minerals. [...] What is waste to the brewer is valuable to the farmer; because of its many nutrients, spent grain is an excellent animal feed. [...] In many small breweries and brewpubs, "digging out the mash tun" is a vigorous daily ritual carried out with a shovel, a welcome portent to the end of the workday. Above, brewster Miranda Dohrman is digging out the mash at Orpheus Brewing, in Atlanta, Georgia. It's sweaty work, but there's beer at the end of the day. When she's not in the brewhouse, Ms. Dohrman arranges things as the brewery's Event Coordinator. 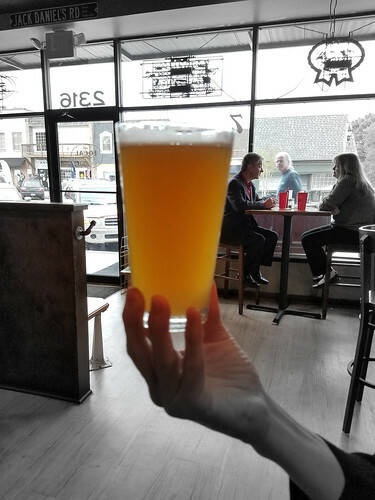 The photo is out-of-focus —I took it through the glass pane separating Orpheus' brewing facilities from its busy-Saturday-afternoon taproom— but you (ahem) get the picture. 19 March 2016.